A 38 North exclusive with analysis by Frank V. Pabian, Joseph S. Bermudez Jr., and Jack Liu. 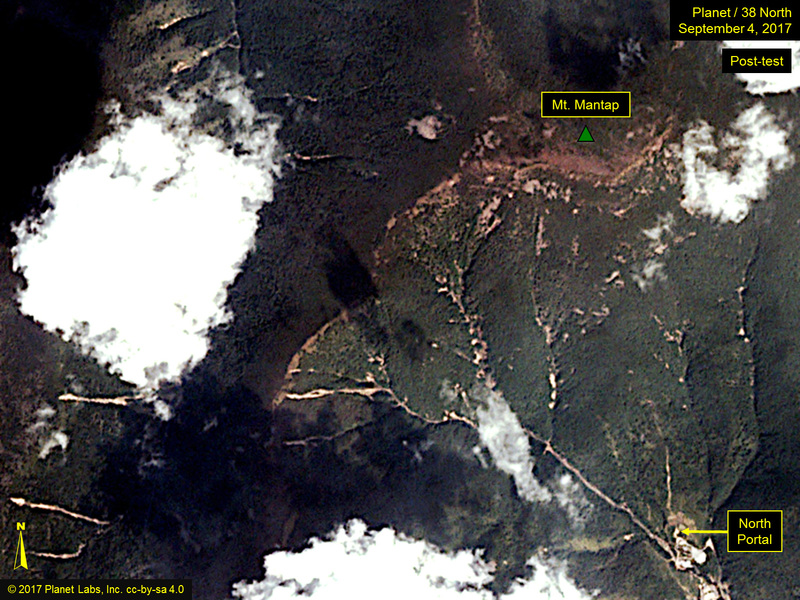 Commercial satellite imagery from Planet, obtained the day after North Korea conducted its largest test to date (currently estimated in the 100+ kiloton range), appears to show numerous landslides throughout the Punggye-ri Nuclear Test Site and beyond. The area of these surface disturbances, which include numerous areas of pre-existing gravel and scree fields that have apparently been lofted in place from the tremors, is centered about Mt. Mantap (elevation. 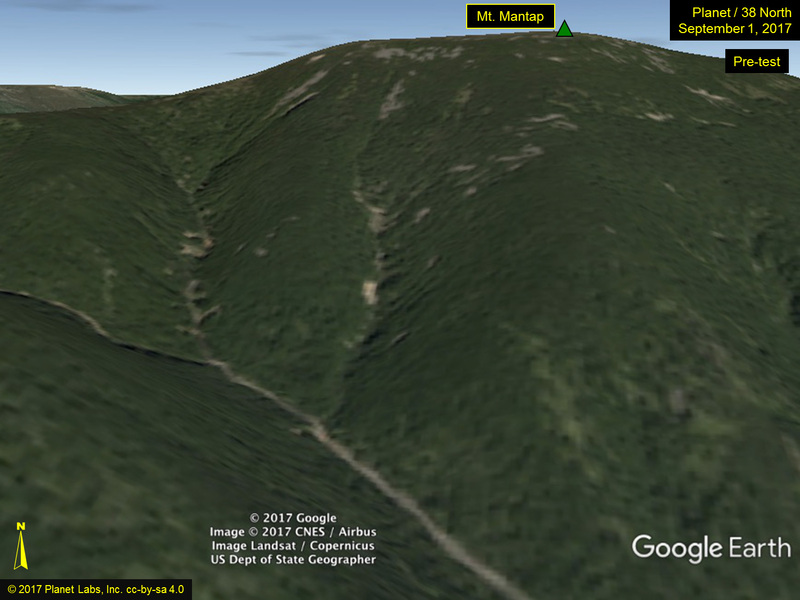 2205 meters). These disturbances are more numerous and widespread than what we have seen from any of the five tests North Korea previously conducted. There does not appear to be any evidence of a collapse crater, as might have been suggested from the post-test tremor. The resolution of this imagery is presently insufficient to show any other damage, (e.g. to buildings at the base of the mountain in the support areas). However, once higher resolution imagery becomes available, additional details will become known and we will report on them at that time. Figure 1A is a pre-test image acquired on September 1, 2017 for comparison with Figure 1B, which is the post-test image acquired on September 4, 2017. This overview provided is unannotated so as not to obscure any part of the image to assist in that comparison. 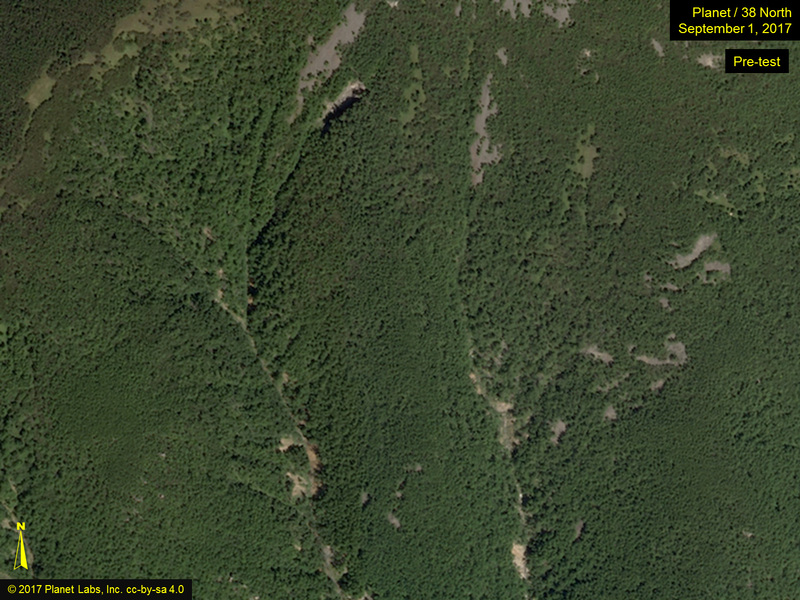 Figure 2A is a close-up of one portion of the slope between the North Portal and the mountain peak showing a number of small landslides going down into a stream bed. Figure 2. 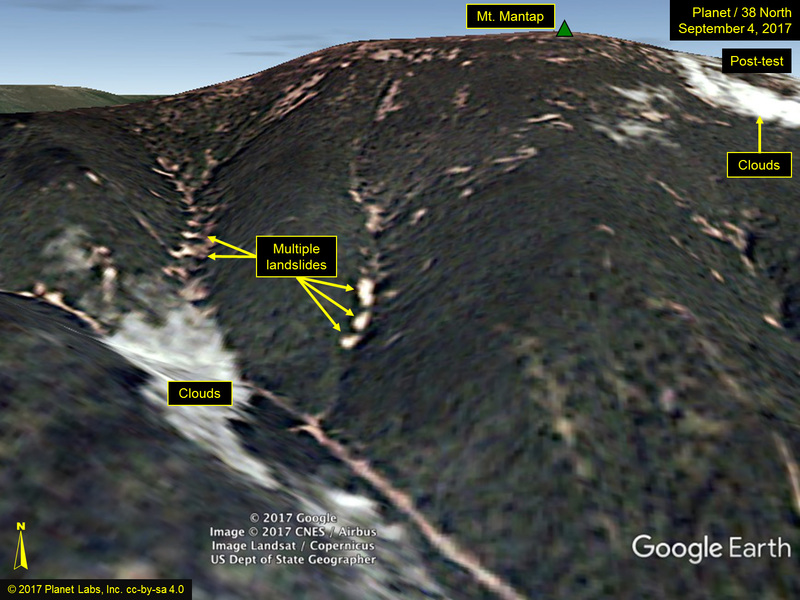 Close-up of slope between North Portal and mountain peak showing multiple landslides. 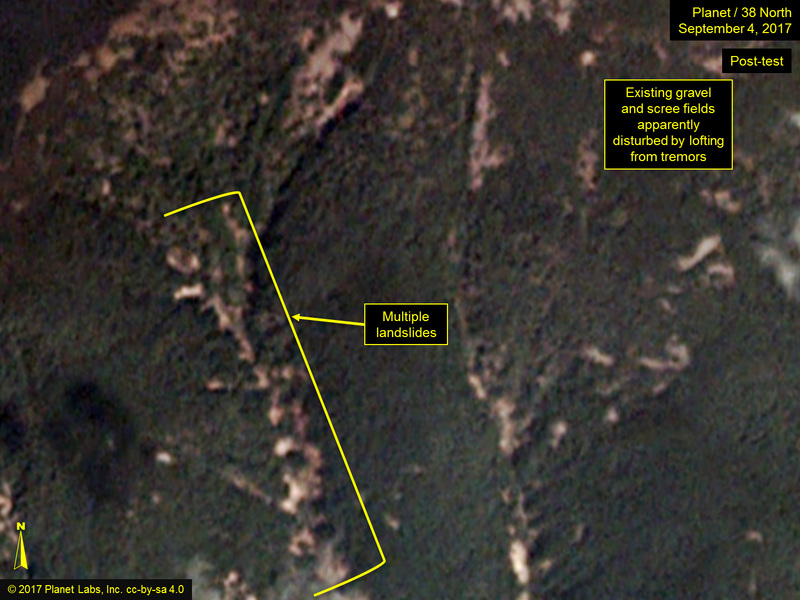 At approximately 03:30 UTC (noon DPRK time) on September 3, 2017, North Korea’s Nuclear Weapons Institute conducted its largest and long-expected sixth nuclear weapons test from the Punggye-ri Nuclear Test Facility. Initial reporting from the US Geological Survey (USGS) first claimed the magnitude to be 5.2, but quickly upgraded the event to magnitude 6.3. Other seismological agencies including the Comprehensive Test Ban Treaty Organization (CTBTO) and the independent Norwegian Research Organization (NORSAR) determined the magnitude to have been 5.8, but more recently increased that estimate to 5.9. While multiple preliminary seismic readings will need to be refined over the upcoming days, if this lower number is correct, NORSAR calculated that the yield of the test device would be about 120 kilotons (or about eight times the yield of the bomb dropped on Hiroshima in 1945, and about six times that of the fifth test conducted at Punggye-ri on September 9, 2016). Lofting is vertical lift (from the underground test shockwave) and shaking. The material falls back down in the same place as before with little lateral movement on flatter terrain. 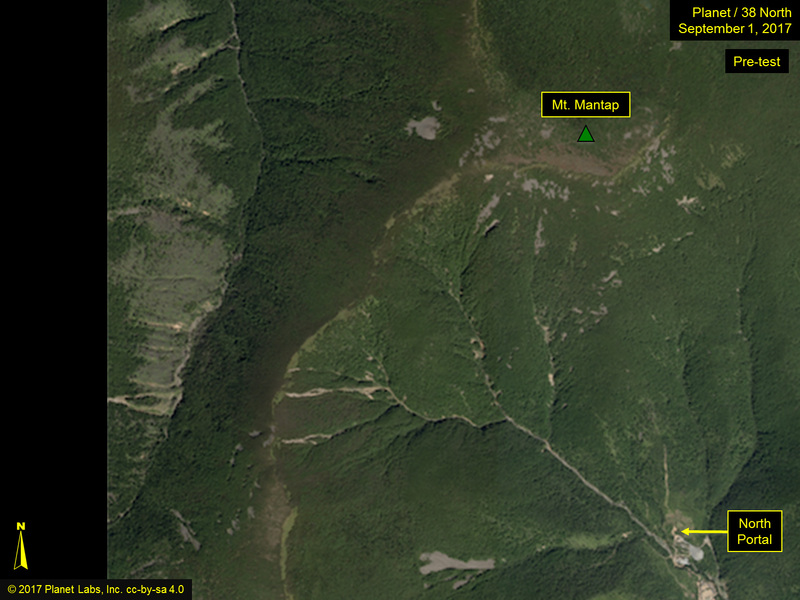 “M 6.3 Explosion – 22km ENE of Sungjibaegam, North Korea,” US Geological survey, September 3, 2017, https://earthquake.usgs.gov/earthquakes/eventpage/us2000aert#executive. https://twitter.com/SinaZerbo/status/904206338099748866 and “Large nuclear test in North Korea on 3 September 2017,” NORSAR, September 3, 2017, https://www.norsar.no/press/latest-press-release/archive/large-nuclear-test-in-north-korea-on-3-september-2017-article1534-984.html. A kiloton is equivalent to 1,000 tons of TNT. A megaton is equivalent to 1 million tons of TNT.